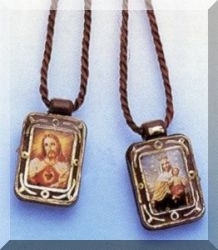 This Scapular has pictures of Our Lady of Mount Carmel & the Sacred Heart of Jesus framed in plastic. Printed on the back are the words Paz (peace) and Amor (love). Brown Cord.